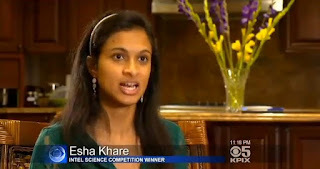 Who is Esha Khare? She has recently became a big name for everyone in electronic and cellphone industry today! The 18-year-old girl from Saratoga, has just won a $50,000 prize Friday at Intel International Science and Engineering Fair for creating an energy storage device that can be fully juiced in 20 to 30 seconds. The fast-charging device is a so-called supercapacitor, a gizmo that can pack a lot of energy into a tiny space, charges quickly and holds its charge for a long time. What's more, it can last for 10,000 charge-recharge cycles, compared with 1,000 cycles for conventional rechargeable batteries, according to Eesha Khare of Saratoga, Calif. "My cellphone battery always dies," she told NBC News when asked what inspired her to work on the energy-storage technology. Supercapacitors also allowed her to focus on her interest innanochemistry — "really working at the nanoscale to make significant advances in many different fields."